Studio - Independent Producers, Ltd.
June (Kim Hunter), an American servicewoman working for the RAF in World War II England gets a radio distress call from a bomber pilot, Peter Carter (David Niven), whose plane is on fire and descending out of control. Carter's situation is hopeless as he has no parachute. He is resigned to his fate and calmly questions June about her life and interests. She is despondent that she can't do anything to help him. Peter bails from the plane over the English Channel. Peter is then seen emerging on to the beach, apparently having survived the fall. As he wanders into the countryside, he sees a young uniformed woman on a bicycle. It is June, and they embrace, not knowing or caring how fate has brought them together in this way. Meanwhile, in Heaven, the new arrivals, mainly servicemen of all nationalities, are being processed. Ultimately, they realize that one name is unaccounted for - Peter Carter. An emissary, the Conductor (Marius Goring) is sent to Earth to rectify the error. As the Conductor makes his appearance to Peter, time stands still; only Peter sees him. The Conductor, a Frenchman, explains that he lost Peter in "that horrible English fog" and that he is bound to return with him to his eternal fate. 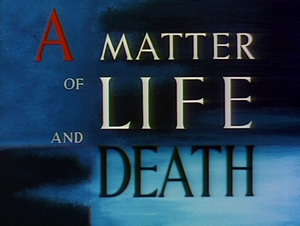 Peter argues that (1) the fault is not his, indeed he had accepted his death and (2) the circumstances are now changed, as he has fallen in love with June. The Conductor ascends a towering, magnificent moving staircase to Heaven to report his findings, and the decision is made that Peter will be allowed to make an official plea in a celestial court room. The prosecuting attorney will be Abraham Farlan (Raymond Massey), the first American killed in the Revolutionary War and who despises all things British. Meanwhile, Peter tries to explain what has happened, to June and to his friend, Doctor Frank Reeves (Roger Livesey). Dr. Reeves believes that Peter has suffered brain damage and arranges for emergency surgery for him. However, Reeves, himself, is then killed in a motorcycle accident. Peter is taken to the hospital operating room where the surgery begins, as June desperately observes from outside. As he slips into unconsciousness, the heavenly trial begins, under the supervision of the Judge (Abraham Sofaer) and is attended by thousands of spectators, uniformed service men and women, and people from all nations. Peter's defense counsel is his friend, Dr. Reeves. Prosecutor Farlan attempts to make the trial a condemnation of the British people, while Reeves calmly keeps bringing the proceedings back to the facts of the case. As his argument ultimately rests on the question of whether Peter and June are genuinely in love, the jury requests to observe them together. The judge, jury and prosecution and defense counsels descend the heavenly stairway directly to the operating room, where Peter attempts to convince them that their love is real. In a Solomon-like tactic, Farlan demands that June take Peter's place in Heaven and she agrees without hesitation. He concedes that their love is genuine, and the Judge grants Peter a long and natural life before he and June are called again. 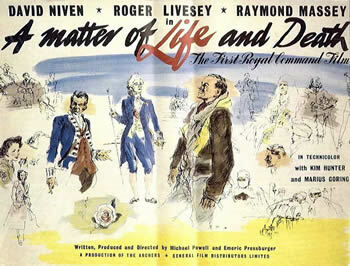 The Earth segments of A Matter of Life and Death were filmed in Technicolor, while the scenes in Heaven are in black and white. The American release title was Stairway to Heaven.